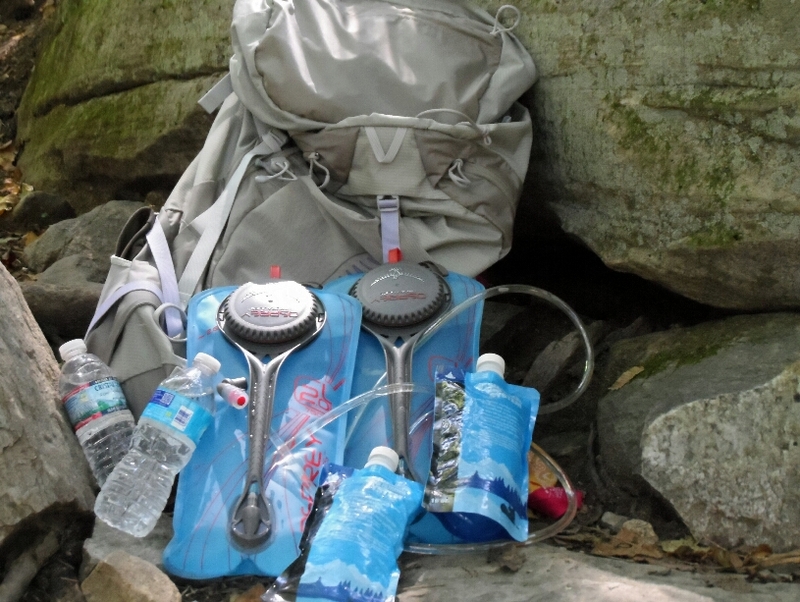 Carry water back to camp (reservoirs for drinking while hiking, bottles to pour into pot for cooking, extra in collection bags to filter for later use) Remember, water is HEAVY so only carry what is really needed! 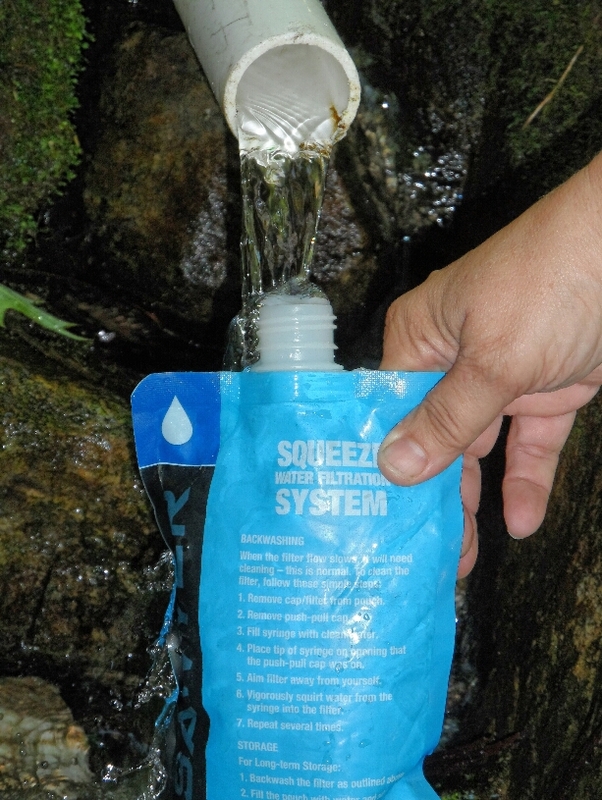 Because we use a small, lightweight “squeeze” filter, it takes awhile to fill all of our water containers. At first this frustrated me. But eventually I decided to consider this time as “zen time” to relax and simply enjoy the moments. 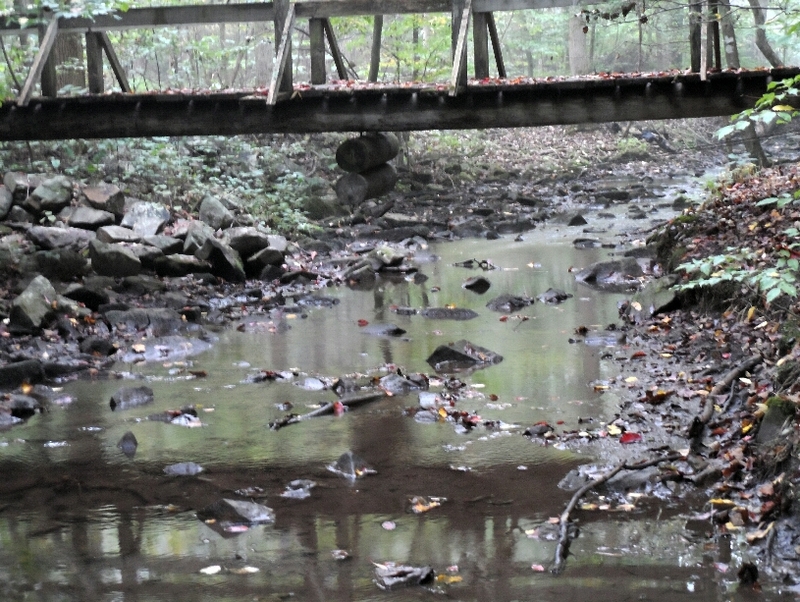 Usually the water locations are scenic, with colorful leaves, rustling trees, and gurgling water. Next time you turn on your faucet at home, take a moment to be grateful for instant, clean, safe water…uncommon in much of the world! 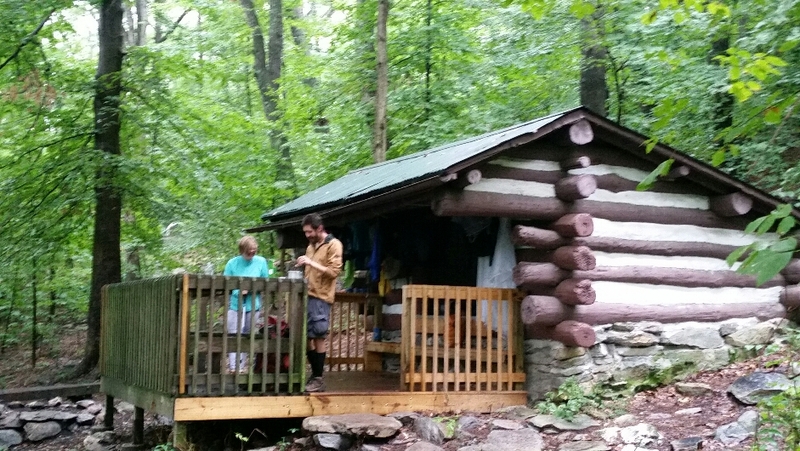 There are “shelters” along the Appalachian Trail, set aside for any hiker to stay for free. These are usually three-sided structures, open on the fourth side. Newer shelters are often more elaborate, with decks, picnic pavilions, lofts, skylights, and more. Like the trail itself, all are maintained by volunteers. 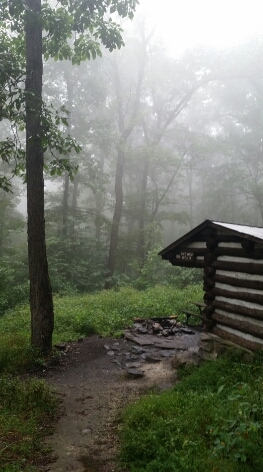 Shelters range in size, offering space for 4-10 hikers to sleep. 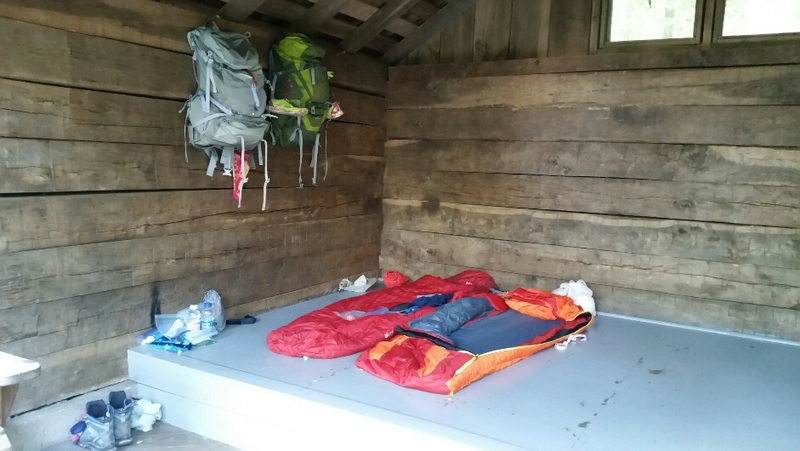 Air mattresses and sleeping bags are spread on the platform (always at least one step above the ground, sometimes at seat height, sometimes with bunk platforms). Backpacks, coats and wet gear hang from pegs. Walking sticks and boots are usually jumbled in the corners. 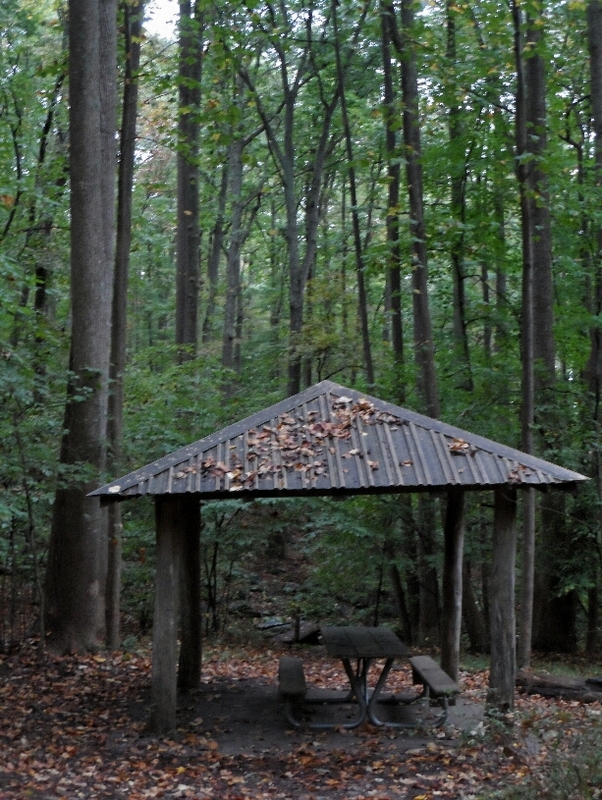 Shelters have nearby tent sites, some type of privy, a picnic table and a fire ring. Newer shelters have a picnic pavilion which can double as extra sleeping space on stormy nights when the shelter itself is full! Shelters are spaced 5-13 miles apart. 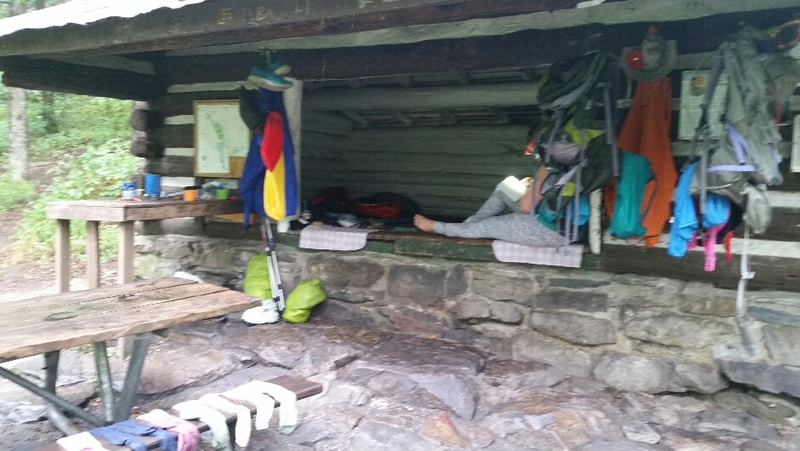 Whenever possible, we enjoy staying at a shelter because of the extra conveniences and because of the social interactions with other hikers. Since we hike short daily distances, however, we sometimes have to find a flat area to pitch our tent for a night between shelters. That has its own charms, including a sense of accomplishment that we can, indeed, be self-reliant. No matter where we end up for the night, we always sleep well. A day of hard exercise certainly helps! 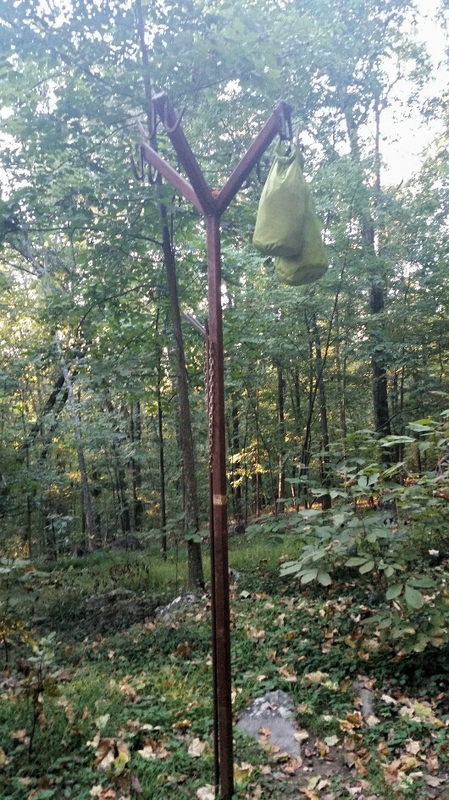 Because of the lack of perfect bear trees, most shelters and official campsites along the Appalachian Trail have installed “Bear Poles.” These metal trees have multiple hooks 12+ feet above the ground. 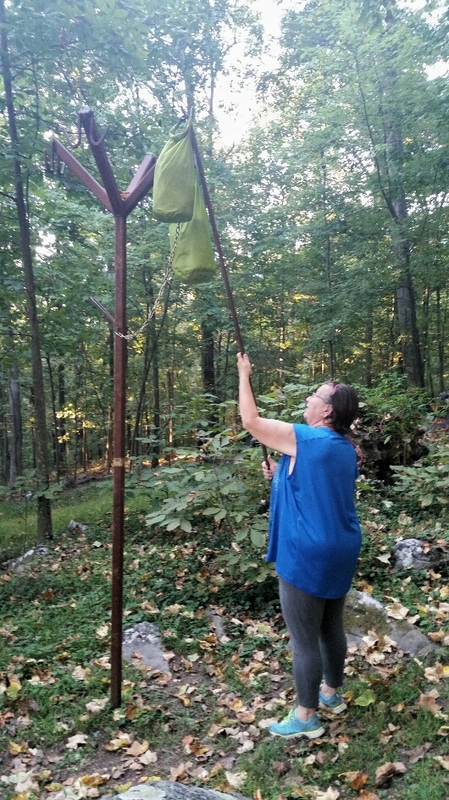 The goal is to use the attached metal pole to lift the bear bag into the air and slide it onto one of the hooks. HAH! I am hardly coordinated enough to do this at chest height where I can clearly see what I’m doing and where the weight of the bag is manageable. Trying to manage this feat with a heavy pole unbalanced by the weight of food bags becomes a comedy of missteps and errors. I’ve decided these contraptions are actually “human torture devices.” Better yet, they are probably secret “candid camera” set-ups for the entertainment of bears. 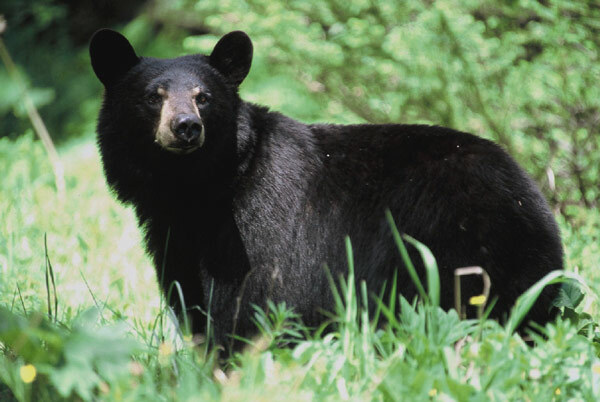 Yep, I can hear that young black bear snickering right now, and I’m sure granddaddy bear is guffawing at my pathetic attempts to master the seemingly simple “bear pole.” Wish me luck, folks, I think Yogi is about to have a picnic with my food! Grab a cart to buy mountains of food. 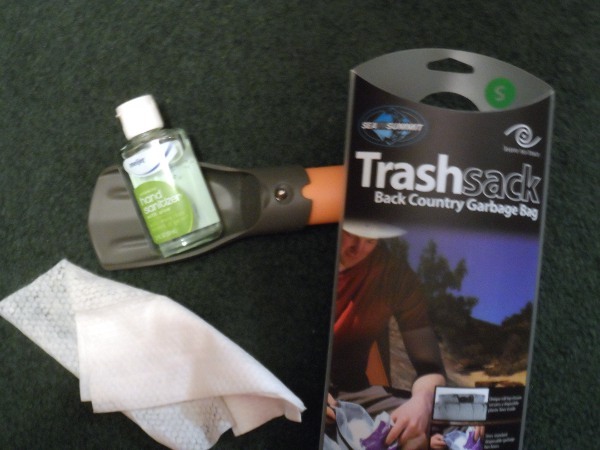 Rebag it and throw away the wasteful packaging. 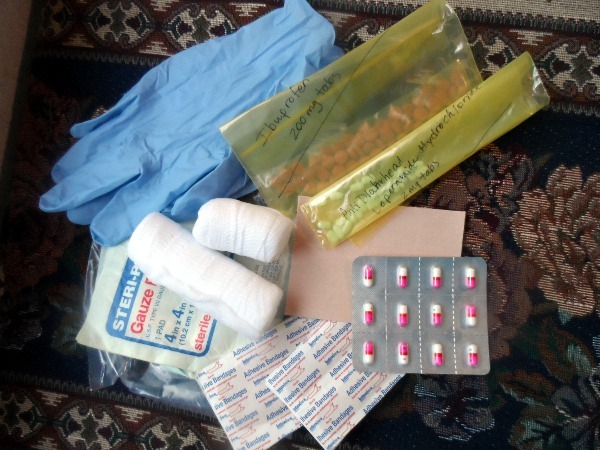 Logistics can be challenging when long-distance backpacking. The ultimate goal is to carry the lightest possible pack. In the case of gear, lighter weight means higher costs. 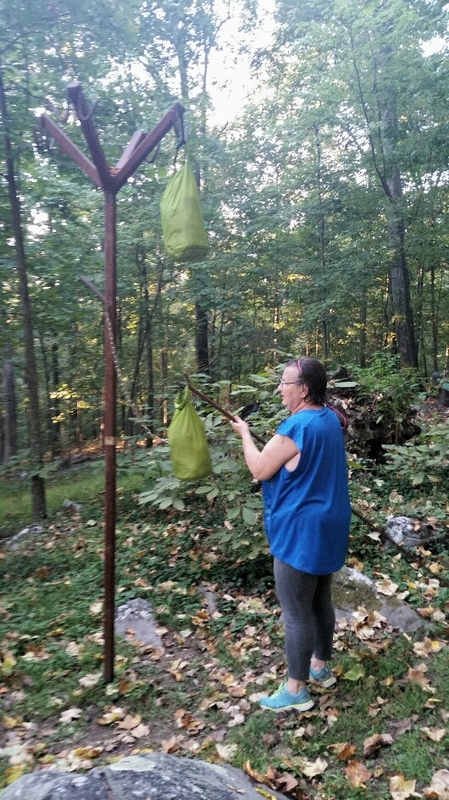 With food and fuel, it is a balancing act of carrying enough supplies to stay on the trail for the most days possible without risking injury or exhaustion from carrying too much weight. Resupply expeditions are costly in both time and money. Most towns are at least a few miles away from the trail. This extra mileage plus all the things that get done on a Town Day usually means a day of no hiking. (If you missed it, read about the delights of a Town Day from 9/18.) 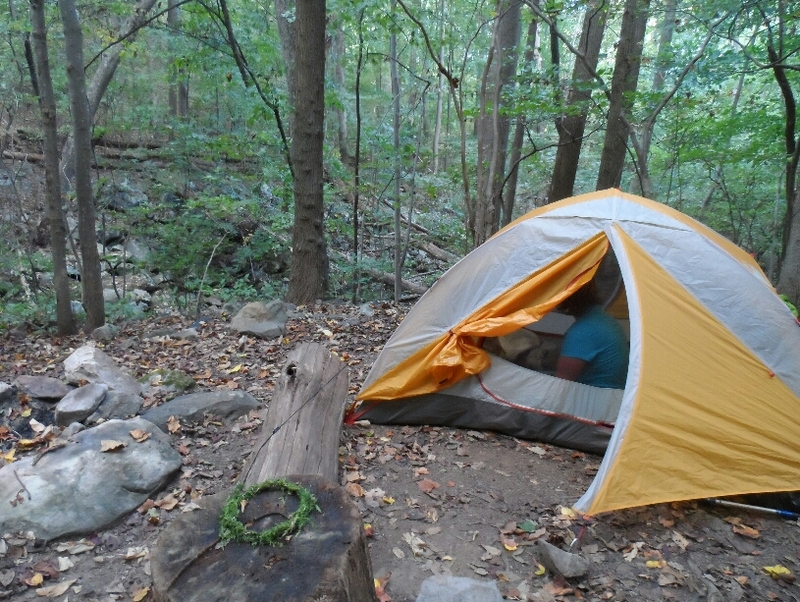 Staying overnight in town obviously increases costs when compared to tent-camping in the woods for free. At our slow pace and low mileage, we each eat 1 ½ pounds of food per day. (Thru-hikers pushing for 3-4 times our mileage often consume 2-3 pounds of food per day and still don’t get enough calories!) We generally plan a partial resupply at a gas station or convenience store 4-5 days after a Town Day. Other items such as fuel and dinners are only found at bigger stores in larger towns—which we reach every 7-9 days. We hustle through the grocery store with our list—oohing and ahhing over all the yummy looking food. We can buy some treats to eat while still in town. 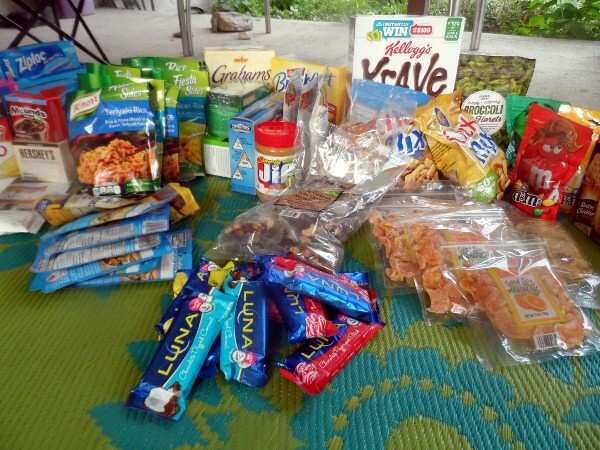 But we have to stick closely to our list for trail food—otherwise our packs would quickly be too heavy to carry! 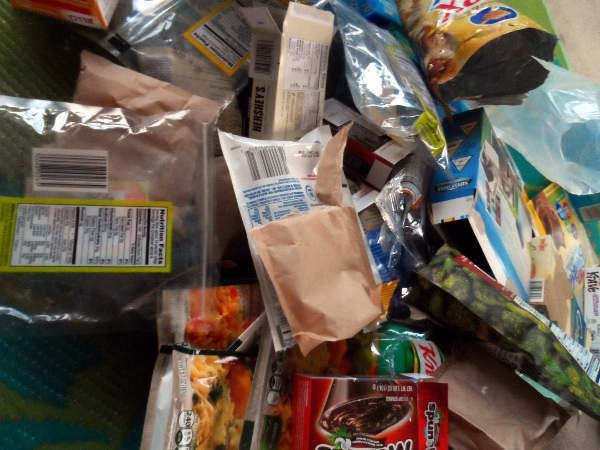 We take most foods out of the wasteful, over-large, heavy packaging. 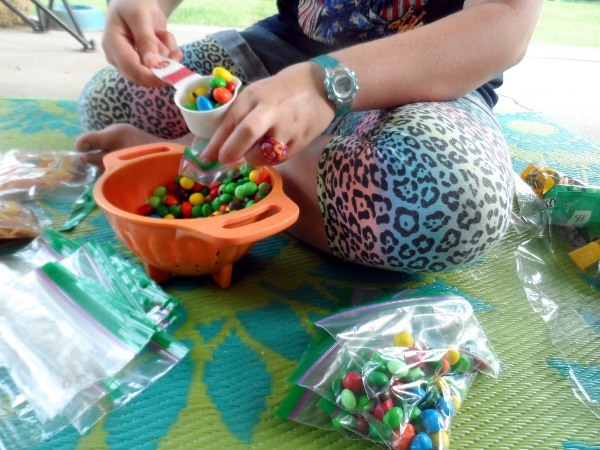 Snacks are divided into individual portions to make sure we don’t mindlessly eat three or four days’ worth at one time. 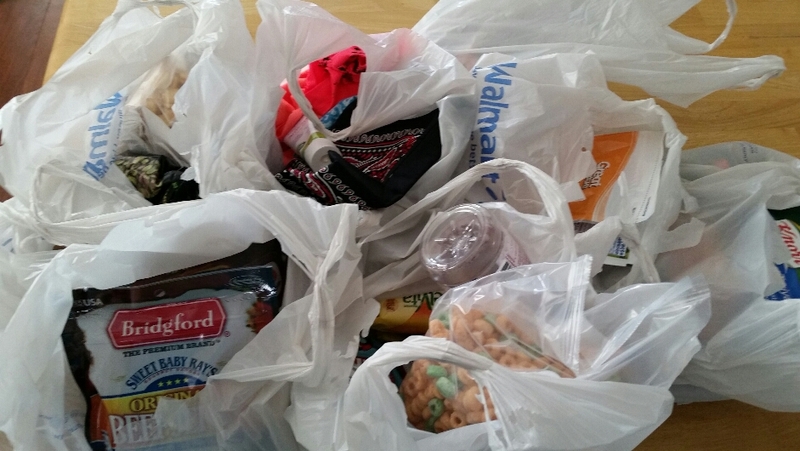 Don’t worry, most of these bags will be saved and reused. Other foods are mixed together in freezer weight bags, ready to have water added at meal time. We have a mound of trash by the time we are finished. But now the food will fit in our packs. Hopefully we didn’t forget anything—it will be a long week before we get to another store! So what hazards are we likely to face? Driving to and from the trail is likely the most risky part of the entire trip! 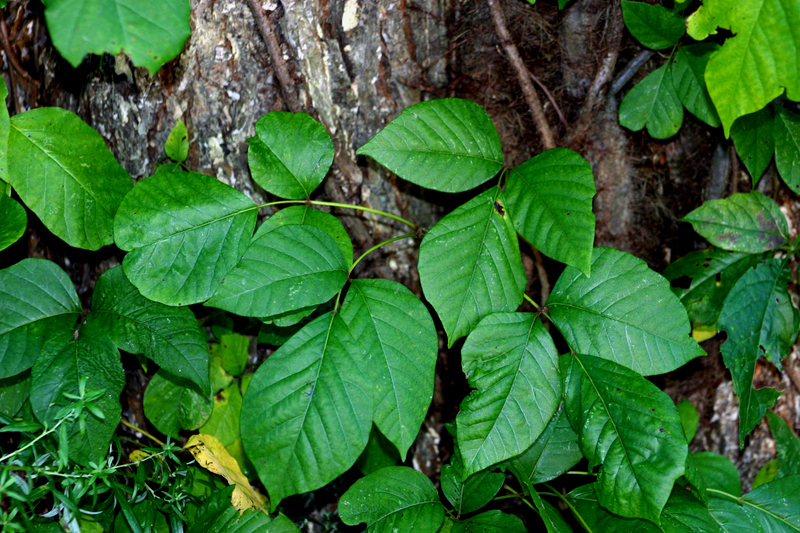 We need to carefully avoid poison ivy. Some folks get lost when driving a route they have used for months. Others apparently have an internal map in their heads including compass directions and a marker of where they are at any given moment. I’m somewhere in the middle. 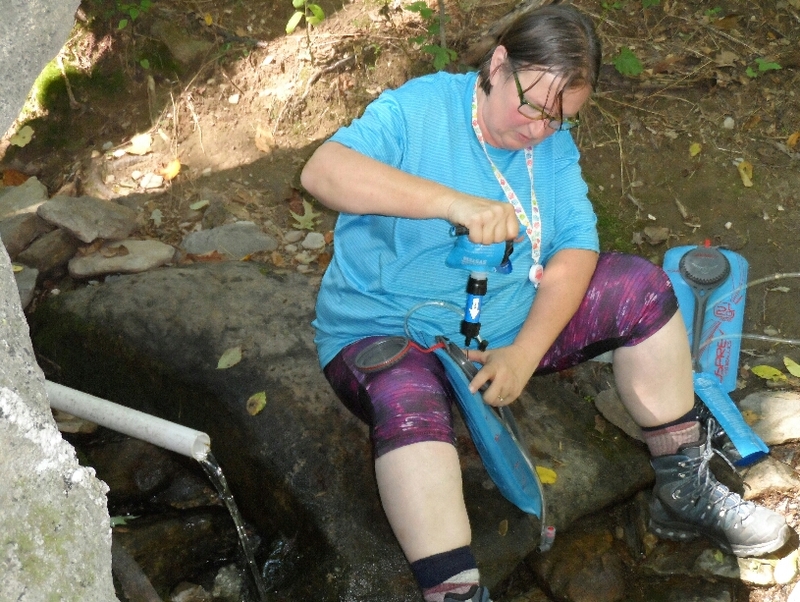 Fortunately, there’s no need for an internal compass when hiking the Appalachian Trail (although it obviously wouldn’t hurt!) 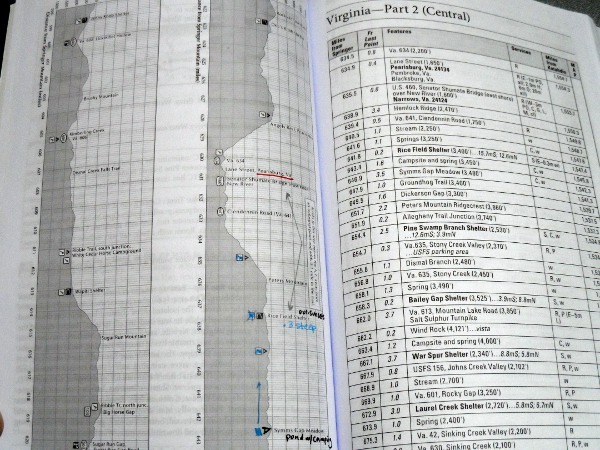 During the planning stages of making a tentative itinerary, I studied the latest edition of “The Appalachian Trail Thru-Hikers’ Companion.” This guide offers detailed information in chart and written form about shelters, water sources, road crossings, and re-supply points. 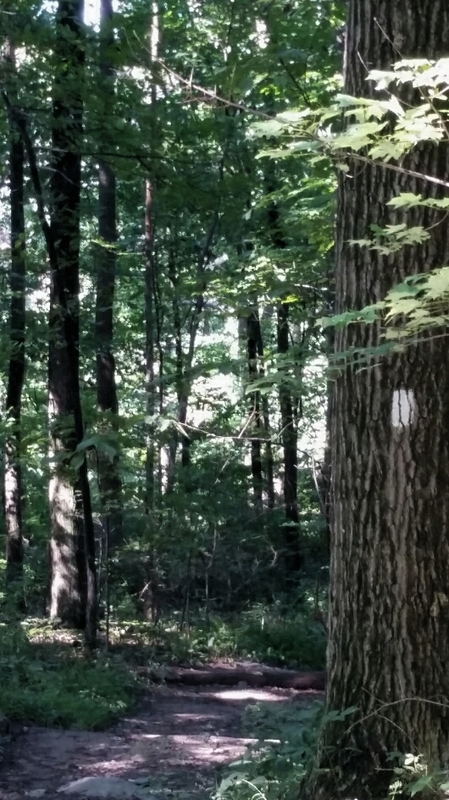 It has elevation charts of each mile of the trail including icons for pertinent information. It also includes maps of towns near the trail. 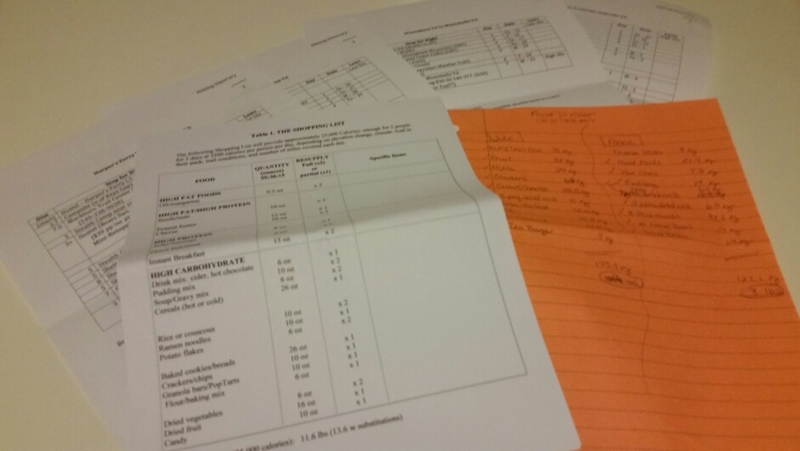 I’ve torn out the relevant pages to carry with us and refer to as needed. There are detailed topographical maps of the Appalachian Trail. Rather than buying paper sectional maps that need to be repurchased as they are updated, I’ve chosen to buy an app for my phone. 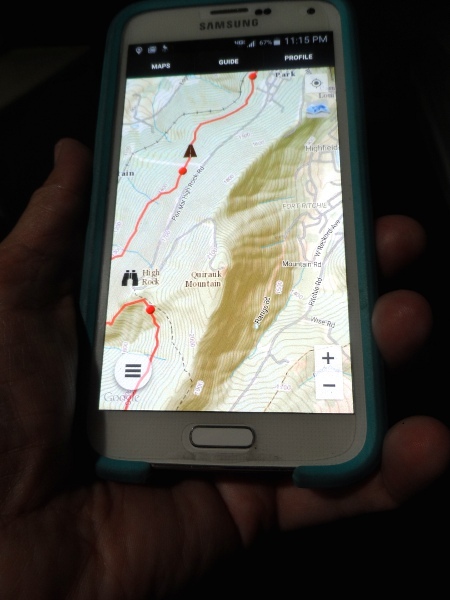 Guthook’s AT Trail Guide allows us to zoom in to see close-up details of the route, including relevant photos. Although it can be used with the GPS feature on my phone, we will use it off-line as a more traditional map. 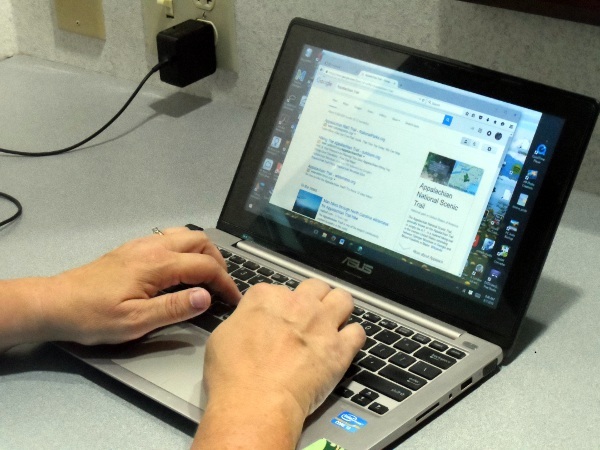 Unlike paper versions, updates are free. With three types of navigational aids and two pairs of eyes, we should do just fine in getting from Point A to Point B without getting lost! We will be (mostly) living in the woods for two months. We will carry what we need on our backs. In general, most folks understand this concept. For those who have not been on a long-distance backpacking trip before, the details may be fuzzy. 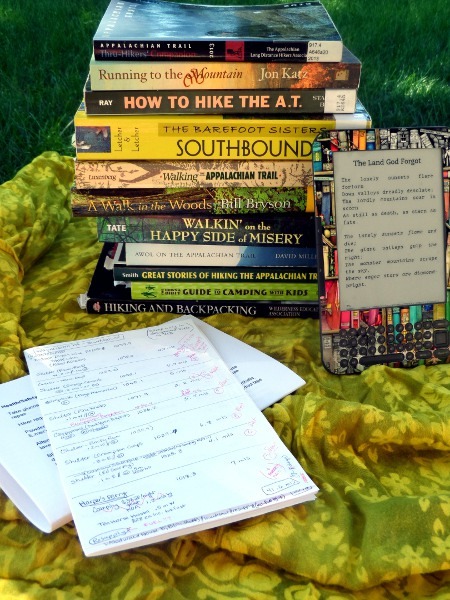 Most books and movies don’t show the nitty gritty of daily life on the trail. 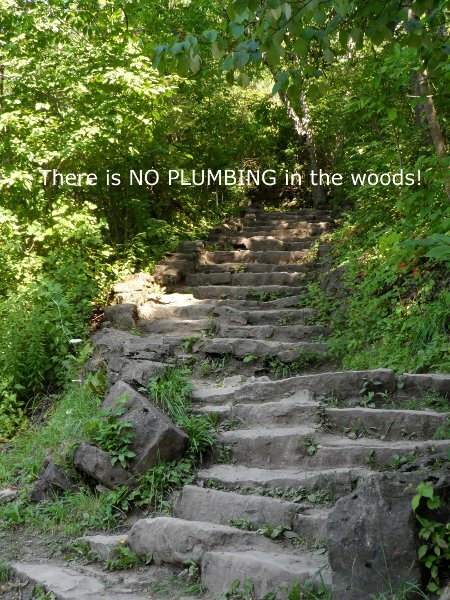 There is no plumbing in the woods! No faucet to turn on for water. No shower or sink (or ready hot water) for cleaning. No toilets to do our “business.” Roughing it may sound manageable for a day or two…but how does a lack of modern amenities work for longer times? 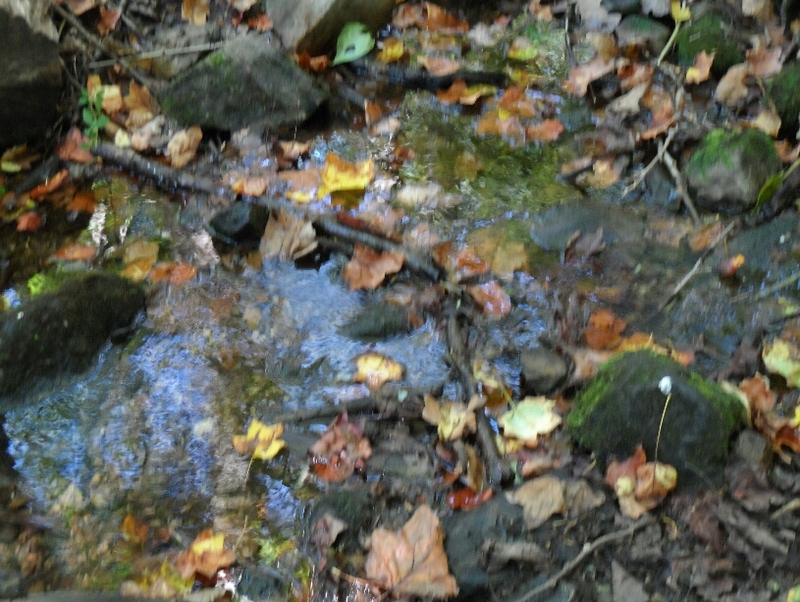 There are streams and springs along the Appalachian Trail. 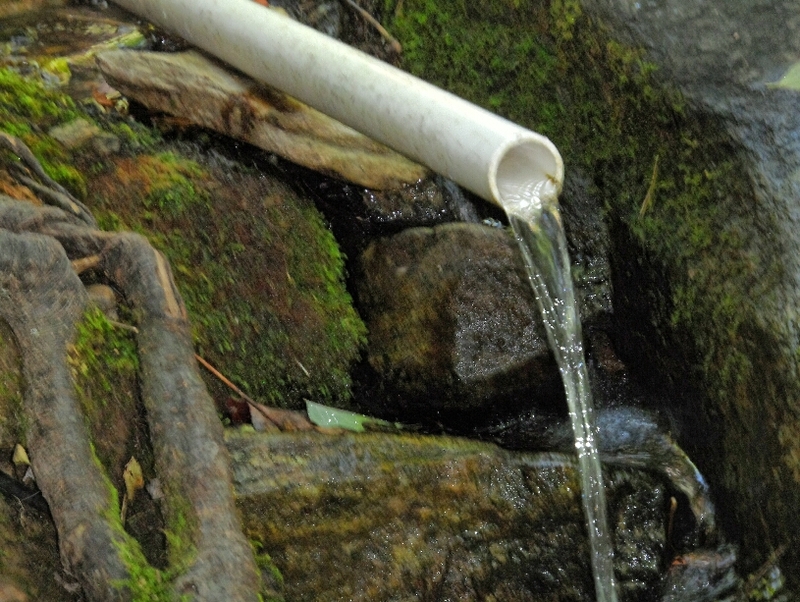 In some places, the water might be clean enough to safely drink. To lessen risk and avoid getting sick, we will filter all water before drinking it. Long-distance hikers quickly become dirty, smelly folks. Hair goes unwashed. Sponge baths are taken with a wet-wipe or with biodegradable soap and cold water (at a long distance from the water source to avoid contaminating it). Socks and underwear get hand-washed most evenings—since we are carrying just one pair to wear and one pair to be drying for the next day. 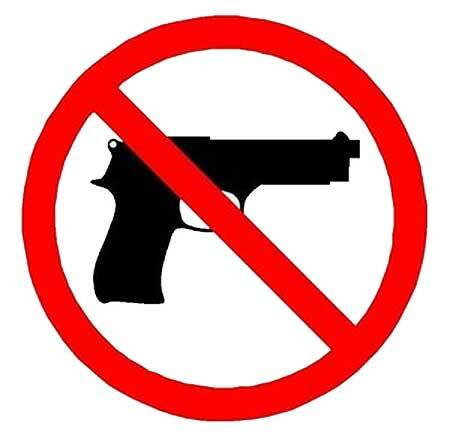 Otherwise, the same clothes are worn day after day. Each week when we are in town for food and fuel resupply, we will savor a hot shower with plenty of soap and shampoo to get body and hair squeaky clean. In addition, we will do a big load of laundry to get smelly, dirty clothes clean again before heading back into the woods for another week of hiking. 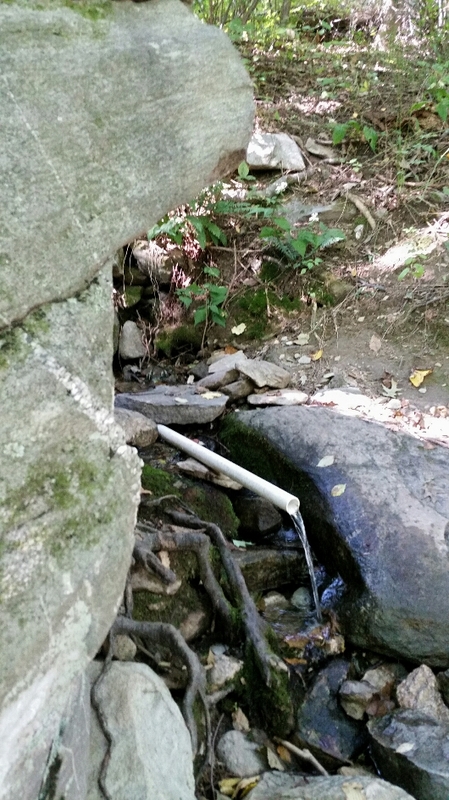 The nitty gritty details show that…long-distance hiking is not for beauty queens!